True to its name, Bellevue Village residents do have beautiful views. 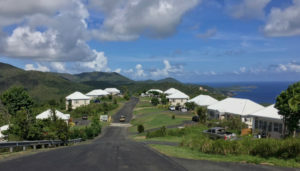 As Virgin Islanders monitor the latest storms approaching the Caribbean, residents of Bellevue Village on St. John are anxious to see promised repairs to their units completed. The possibility of Hurricane Issac coming through later this week is eclipsing a recent issue regarding rent abatement as well as an ongoing controversy about home ownership in affordable housing developments on St. John and St. Thomas. 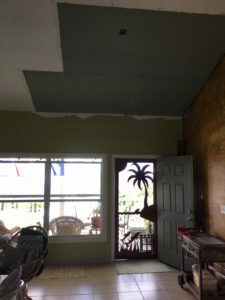 Keryn Bryan, whose apartment in Bellevue Village was damaged by Hurricane Irma, said she had been in touch with contractors to remind them some of the rafters that support her roof were still missing, and that the repairs to her ceiling and the tin patches were only meant to be temporary. “When you look though my ceiling, you can see cracks of daylight coming through,” said Bryan, adding she didn’t feel safe in her apartment during a storm with the current level of repairs. Bryan’s apartment was one of five units seriously damaged when Hurricane Irma tore through the island on Sept. 6, 2017. Many other apartments in the 72-unit development suffered blown-out windows and doors, and the ensuing leaks led to mold problems. This patch on Keryn Bryan’s ceiling was supposed to be temporary, but it’s still there a year after the hurricanes hit. Neighbors helped Bryan patch her roof immediately after the storm, but over the next six months, no repairs were made by McCormack Baron Management, Inc., the off-island managers, or by AIG, the development’s owner. 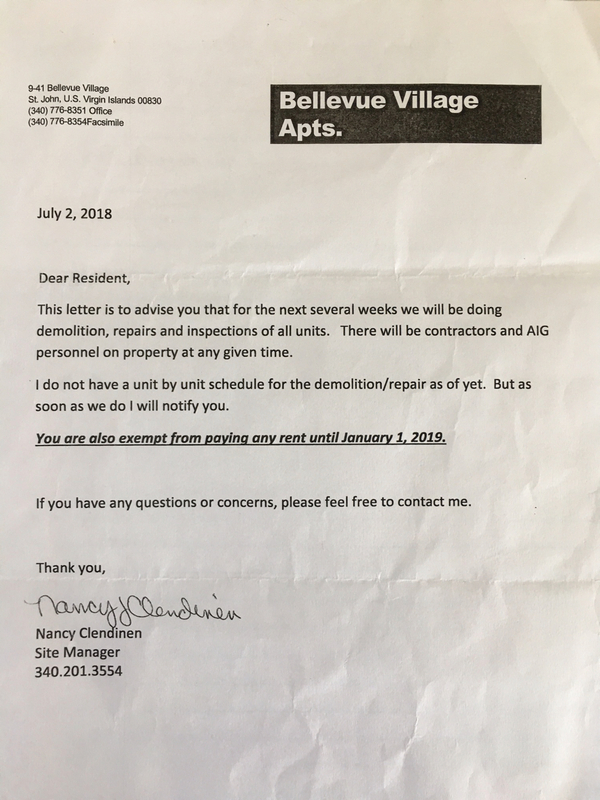 The residents of Bellevue Village formed a tenants’ association in May after months of inaction. 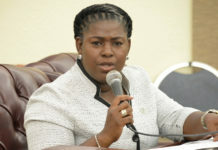 After Sen. Myron Blyden became involved, residents in all units were informed in a letter dated July 2 that assessment of damage was underway and tenants would not have to pay rent until January 2019. But on Aug. 29, tenants received another letter stating that inspections of their units had been completed; based on the assessment of their individual unit’s damage, their monthly rent “was being reduced on a temporary basis” and was due Sept. 1. Bryan ‘s letter stated that no rent was due for her unit, but an unknown number of other tenants did receive letters informing them of the amounts due and were alarmed that they were given only a couple of day’s notice. 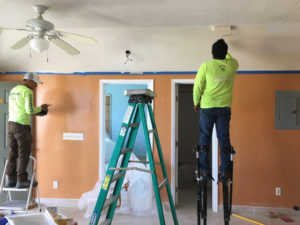 Workers perform repair work on a Bellevue Village apartment. Blyden said he would meet with representatives this week from the construction company overseeing repairs contracted to Shear Construction at Bellevue Village. He said a lot of the problems stemmed from poor communication. The situation at Bellevue Village is similar to that of the Lovenlund Apartments on St. Thomas. Damage from Hurricane Irma to that 195-unit complex was “horrible,” according to Kamela Hughes who serves as the public relations officer for their tenants’ association. While Bellevue tenants paid full rent for their damaged units through June 2018, most tenants at Lovenlund stopped paying rent in September 2017. In late August, Lovenlund tenants also received letters informing them that adjusted rents would be due Sept 1. Blyden said tenants were especially concerned because of an ongoing dispute about a home-ownership program that was promised to many tenants when they first signed leases at Lovenlund and Bellevue. Both Lovenlund and Bellevue were developed and owned by Reliance Housing Foundation, a Fort Lauderale-based, not-for-profit developer of affordable housing. Reliance offered renters a homeowner incentive program: if paid on time, a certain percentage of each resident’s rent could be used as down payment for the future purchase of a home. After Reliance sold the property to AIG, the new owners claimed to be unaware of the promise of home ownership, according to Bellevue tenants. Tenants at both developments were concerned that if they missed paying their September 2018 rent on time, they would be disqualified from participating in the home ownership program. “If you’ve been eligible for ownership for 13 or 14 years, you don’t want to be affected by this,” Blyden said. The status of the home ownership program is still under review, according to Corliss Smithen, public media officer for the V.I. Department of Justice. “The attorney general is still in discussion with the Housing Finance Authority and AIG, the owners of the apartments,” Smithen said Monday. In an Aug. 2 news release, Attorney General Claude Walker said he met with AIG President Thomas Musante and they discussed the home ownership program. “We had a very lively exchange of views on having the tenants become homeowners, as the tenants contend that Bellevue was designed to be a homeowners’ conversion program, and that is correct,” Walker said. As tenants at the Bellevue and Lovenlund developments continue to press for their concerns, tenants at the Calabash Boom Apartments are also trying to form a tenants’ association. Located on the East End of St. John, the Calabash Boom development consists of 48 apartments and 24 townhouses, some of which are already owned by tenants. Calabash Boom, completed in 2010, also was built by Reliance Housing Foundation. Eight residents from Calabash Boom attended an August 28 meeting of the Bellevue Tenants’ Association; Sen. Blyden, Kemala Hughes from Lovenlund, representatives from Shear Construction, and others participated in the meeting. Pat Richards, a resident of Calabash Boom, said tenants there also received letters on Aug. 29 setting out new rates for rent of their units starting in September. In spite of some storm damage, including broken windows, and an infestation of rats and roaches following the storm, Calabash Boom tenants have been paying full rent since September 2017. However, Richards said she was mystified by the new adjusted rents quoted in the letters to tenants. “I don’t know how they did their assessments. Some people who didn’t have any damage were told they pay no rent at all. Others have damage and were supposed to pay all but $40 or $50,” she said. The letters sent to tenants at Bellevue and Calabash outlining the new rental rates were not signed and did not contain a letterhead or logo. Richards said residents of Calabash Boom would meet at 7 p.m. Friday to discuss establishing their own tenants’ association.